Reading Enid Blyton was one of the most vivid pleasures I had as a child because her adventures were routinely punctuated by picnics and midnight feasts. Whether packed by mothers convinced that their children were on the brink of starvation or smuggled in by students intent on mischief, they were marvellous spreads of thick sandwiches, fried kippers, mince pies (who would have guessed those were not savoury and meaty?) and homemade cakes. I would have given up a favourite toy just to enjoy a meal straight out of those books but Noshtrekker’s approach is subtler. In its Eat My Words series, the Singapore-based specialist of unique dining experiences interprets literary works through the culinary arts. We were fortunate to attend one such dinner, a tribute to Tan Twan Eng’s evocative The Garden of Evening Mists in his birthplace of Penang. 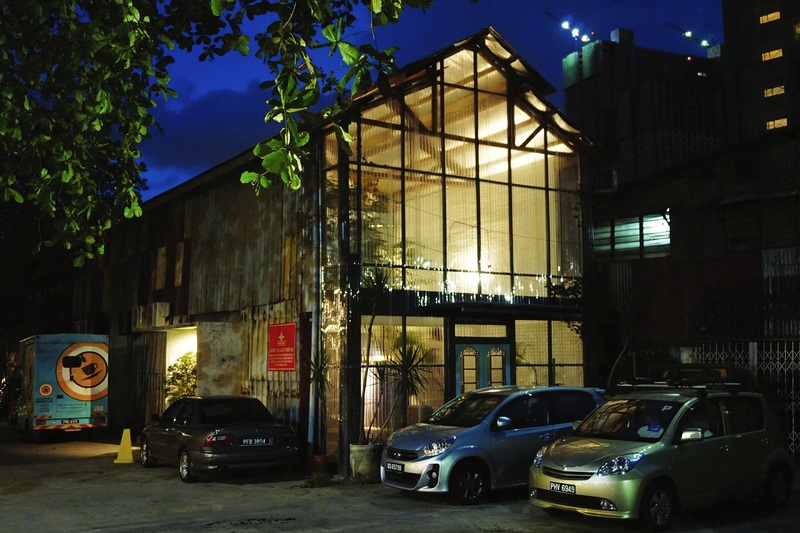 Though not a prerequisite, it immediately became apparent that familiarity with the text was an advantage in understanding where chef Kim Hock Su, a finalist in San Pellegrino’s Best Young Chef 2016, was going with the four-course menu at Restaurant Au Jardin, set within the Hin Bus Depot in George Town, Penang. Each course was designed in response to a passage from the book and sought to capture in composition and flavour the events, emotions and contexts of the selected excerpts. Homemade white bread and mushroom butter laced with truffle, a foolproof medley of fluffy canvas and earthy creaminess, broke the ice among guests, seated at small tables around the intimate venue. Some were in town for the George Town Literary Festival, taking place that same weekend, while others were holidaymakers or travellers passing through. Stories were exchanged as we shared potato crisps with dollops of salmon roe and that’s when I discovered I was the only one at my table who had read The Garden of Evening Mists. My fellow diners, a jolly foursome, made a game of trying to guess the mood being conveyed on the plate. In an extract from the first chapter, protagonist Teoh Yun Ling, a judge who had helped prosecute Japanese war criminals after losing her sister during the Japanese Occupation, seeks out the enigmatic Aritomo, an exiled former gardener of the Emperor of Japan, to help her build a memorial garden for her sister. The quoted passage touched on the unspoken understanding between Teoh and Aritomo, of the complications of love and loss, underlined by the tension of their standing in opposing factions in the brutal conflict between the Malaysians and the Japanese. This was represented in a silky paté of duck and chicken livers served with crisp, thin croutons, jellied consommé and cold peas, trickling down like tears when nudged by a fork. It was a layered illustration, the flavours muted and suppressed. Sans context, my table took wild guesses at what this could mean. Fortified by wine, they theorised everything from a possible deportation to death. The flavour of the text seemed clear enough to the novice, though, so while reading the book would have filled in some blanks and given deeper meaning to the culinary interpretations, it was entirely possible to approach this without. 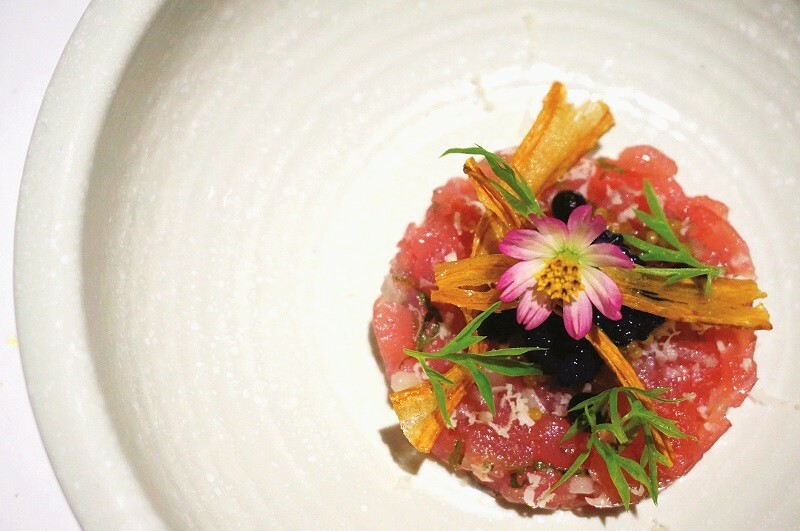 An excerpt from the seventh chapter, where Aritomo guides Teoh through the renowned Yugiri, the garden he had landscaped in Cameron Highlands, was expressed in a mosaic of yellowfin tuna, shiso leaves, lemongrass, pickled mustard seeds and burdock with an ulam raja flower garnish. It conjured Teoh’s journey of discovery as she uncovered the elements that made Yugiri so beguiling, each judiciously placed by Aritomo himself: the raw mango-like kick of the flower gave way to the bite of pickled mustard seeds and, finally, the brine of the skipjack tuna tartare, mimicking the turns of the maze-like garden to the koi pond. 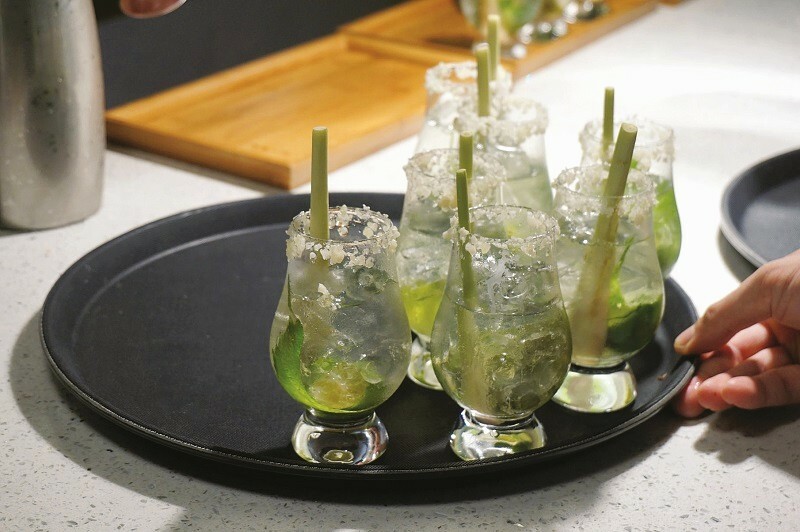 Falling in Love with Aritomo was a gin-based cocktail (a non-alcoholic version was available too) with lemongrass, shiso leaves, sparkling water and limau kasturi. It was served mid-menu, accompanied by Teoh’s early inklings of the romance budding between her and the reserved gardener, and, along with the storm of meteors mentioned in the text, recreated with popping candy that sparkled in the mouth. 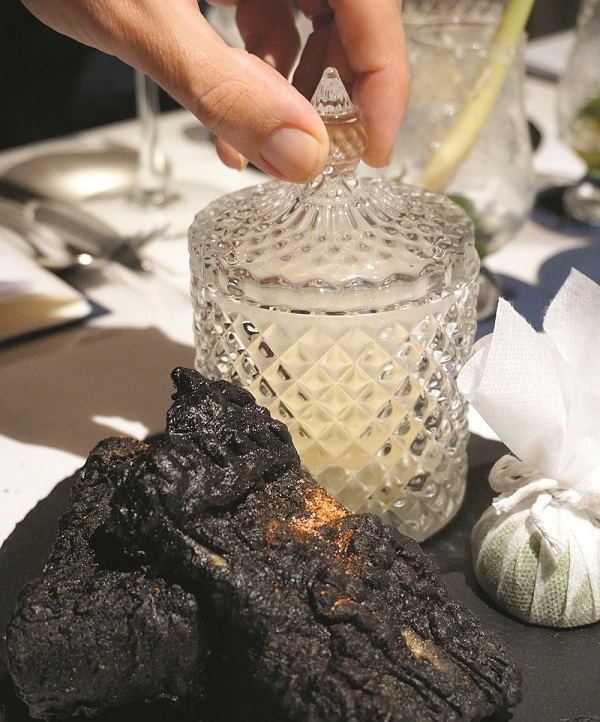 The main course paired to this passage was a slab of barramundi blackened with a bamboo charcoal and squid ink batter and served with a remoulade of fennel, cucumber and tandoori powder that acted as a tartar dip. Its presentation drew gasps of appreciation, from the unusual colouring of the fish — I’ve had kitchen experiments that looked like that and they most certainly ended up in the bin — to the serving of a lemon wedge in a tied cloth to trap the seeds and a faceted glass for the remoulade. The aroma of smoked hay preceding the dish evoked the scent of the battlefield while the dark charcoal and ink batter recalled the cloak of night, elevated with zingy spikes of lime citrus that captured the tension of the artillery barrage. A poetic analogy by Aritomo that likens the changing of seasons to translucent silks, beautiful in themselves but wondrous when their edges are laid atop each other, inspired the dessert. 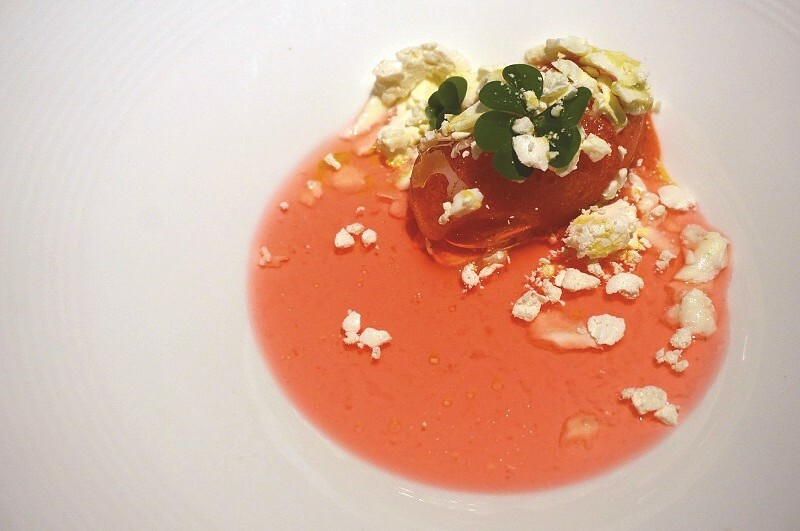 The overlap between seasons, when one gives way to the other, was reenacted in a medley of strawberry and sorrel sorbet with frozen mascarpone and meringue floating in a sea of pink sorrel tea and adorned with a jellied strawberry “blanket” and lemon basil bulb. The jewelled tones referenced the silks and the herbaceous tea tempered the strawberry’s tartness and spearsof sugar in the meringue. I personally did not think the elements sang well as a cohesive chorus but the others at my table truly enjoyed this ending. For those who so desired, wine pairing was provided with a beautiful selection of young labels. Escorting the paté was a 2016 Michel Lynch Bordeaux blend of Merlot and Cabernet Sauvignon while the tuna tartare and main were matched with a Marlborough Chardonnay and dry Riesling respectively, both from New Zealand. Credit has to be extended to Noshtrekker and chef Kim for tackling such a complex book, especially one so heavily underscored by melancholia. Although there were a couple of hiccups — the barramundi, for instance, was on the cold side as the small kitchen set-up forced the team to prepare each piece individually or in pairs — it was a strong attempt overall and the concept could not be faulted. A couple of diners were even inspired to pick up the novel after dinner — a compliment indeed to the endeavour. However, my favourite anecdote was an aside confided by the Noshtrekker team that significantly increased my liking of the author. Tan was sent the proposed menu ahead of the dinner but instead of feedback on the dishes conceptualised by Kim, he returned it with grammatical corrections and suggestions on comma placements. That is a writer, through and through.